The CRM section helps the sales team to quickly calculate the product cost and lead time and track the sales process from quotation through invoicing and delivery. 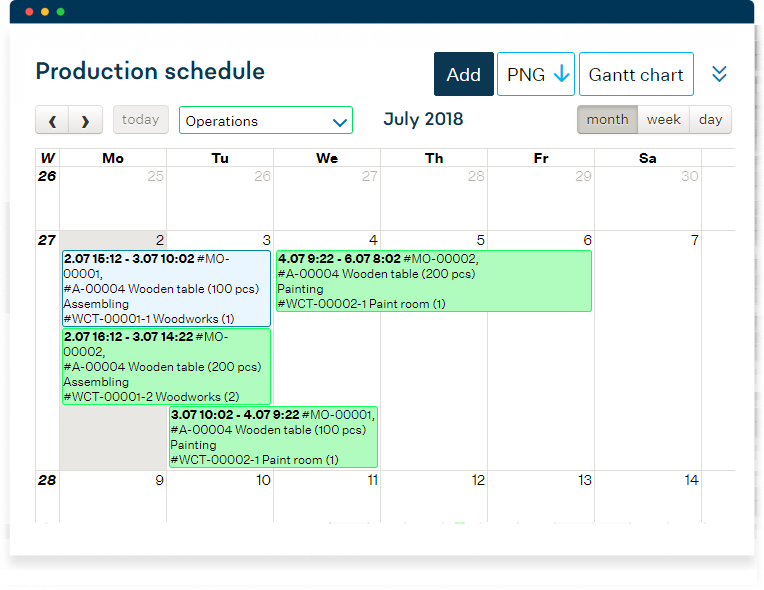 Production planning lets product managers schedule operations and materials in a couple of clicks, as well as to see the visual production calendar and Gantt charts and use dynamic drag-and-drop rescheduling. Stock functionality is for inventory control, stock movements, shipments, tracking of stock lots and serial numbers and much more. 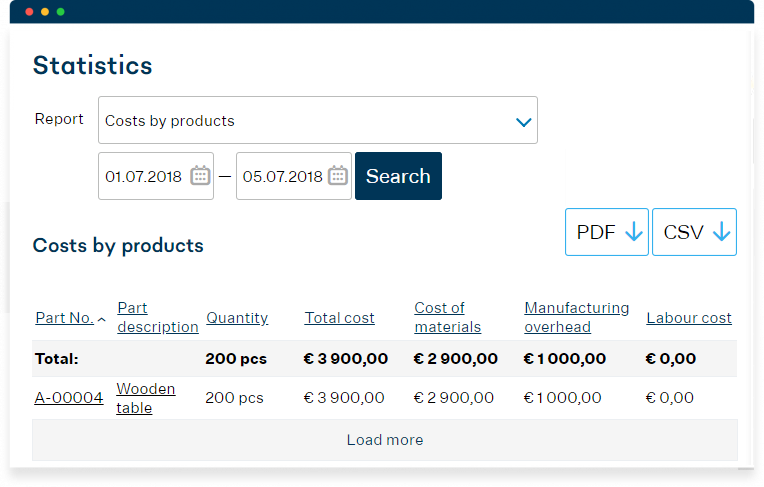 The Procurement section is for managing purchases and allows you to see everything you need to purchase and to raise pre-filled purchase orders with a single click. 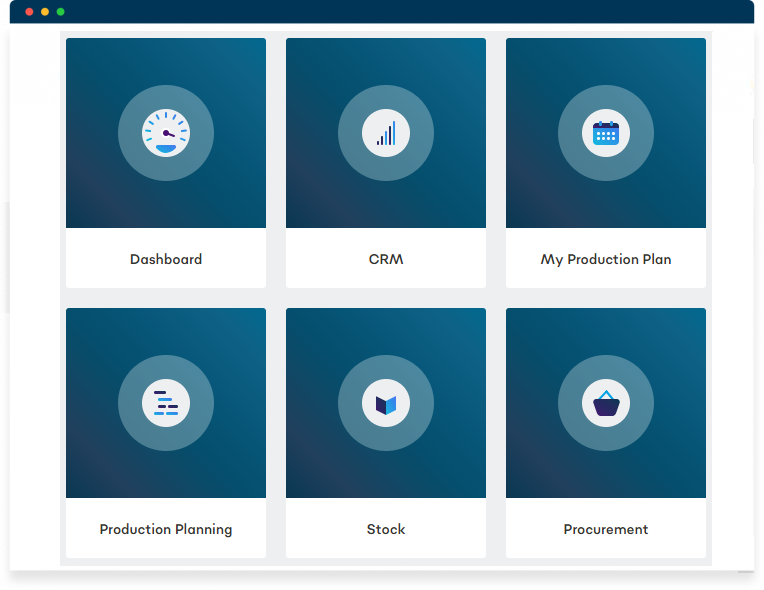 The “My production plan” section allows workers to access their tasks on a nice calendar and report with a single click via laptop, tablet or mobile. Have full visibility of your manufacturing process from shop-floor to top management, from stock to work in progress and orders delivered. Needed information moves from one department to another automatically at any given time for quick decision-making. Monitor your processes from one dashboard and have an at-a-glance overview of the whole operation, such as late COs, late MOs, late POs, min. stock and sales performance and immediately act when the unexpected occurs. Track patches, product series, versions, managed quality levels and materials expiry dates. Have your business-related data and processes measurable, analyzable and constantly look for ways for improvement. Start a free trial to test the product, select the features plan that meets your requirements and start using MRPeasy without contacting sales, without investing in setting up the software or without having to pay high consultancy fees. Access the necessary functionality of MRPeasy as your company grows and new requirements arise. Use MRPeasy help resources, such as the Online User Manual, Implementation Guidelines and Demo Videos and stay on top of the implementation process. Have your ERP constantly updated and always use the latest version of the software – there is no need to worry about manually updating the manufacturing ERP software. Have your business data safely stored in the cloud backed by professionals. MRPeasy is simple yet powerful manufacturing ERP software that helps small manufacturers organize production. Just sign up to test MRPeasy, select the features plan that meets your requirements and access additional functionality as you grow your business.